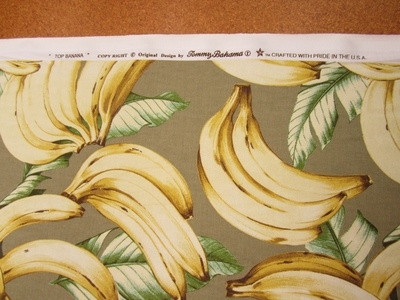 Tommy Bahama Top Banana Bleached Sand 801250 from the Above the Treetops collection is a colorful, fun botanical print pattern of clusters of bananas and leaves on a one hundred percent cotton ground cloth. The bananas range between six and seven inches in length. In Off White, Pale Honey, Bark Brown, Aqua Blue, and Palm Green everything is showcased against a warm Dark Sand background. 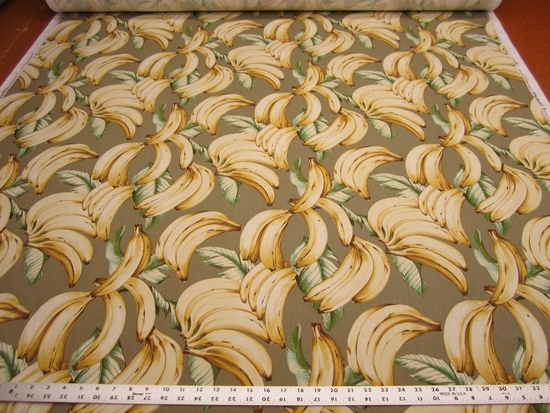 Top Banana is suitable for window treatments, cornice boards, pillows, cushions, table toppers, room dividers, bedding, headboards and furniture upholstery. Width: 54" Construction: Print Fabric Style: Novelty Fabric, Tropical Fabric Fiber Content: 100% COTTON Pattern Repeat: Vert=16.00" Horiz=13.50"